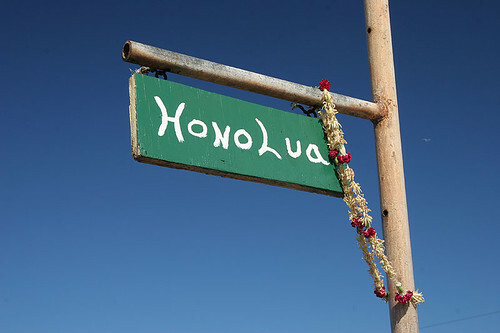 I’m going to catch up with a couple of additional posts covering some of the other areas we visited on Maui. We decided to slow down and hang out for a bit on West Maui in between our visit to Waikomoi Preserve and Hana. 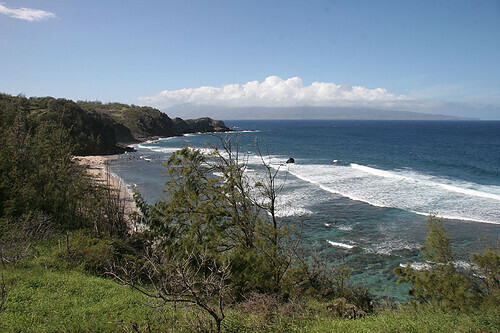 It was a beautiful sunny day on West Maui. A few clouds, a slight breeze and lots of sun. We spent the morning relaxing on our lanai watching the families on Napili Beach. I went for a swim and noticed a crowd around the rocks. Honu! A sea turtle had been spotted. I joined the crowd to watch it eating off the algae on the rock. It would poke its head up to grab a breath and then the tail would come up. It was very large. Much larger than what we saw in the Ocean Center. Around noon, we headed out to explore the area north of Napili. Napili is pretty far north along the coast. 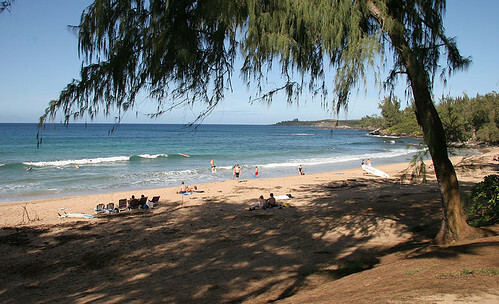 The next big area is Kapalua resort area. This is a beautiful resort that put in a lot of effort to preserve both the marine and mountain areas near the resort. I wish we had had more time to explore some of the areas near the resort such as Kapalau beach and the seaside and mountain trails. We headed instead up Highway 30 towards Kahakuloa. This is another one of those “don’t take your rental car on” roads. It turns into narrow, one-lane, cliff-hugging road. 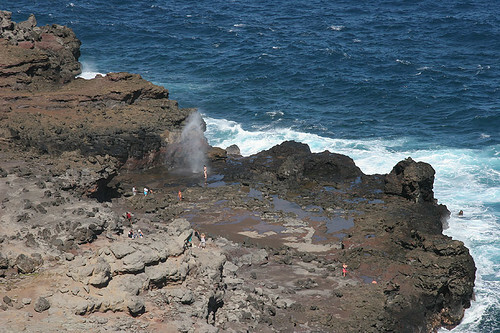 We had read and viewed videos on the web and knew that it was not that bad of a drive up to the Nakalele blowhole which is only about 8-10 miles from Kapalau. This area is paved and two lanes although there is no yellow or white line. What a gorgeous drive. 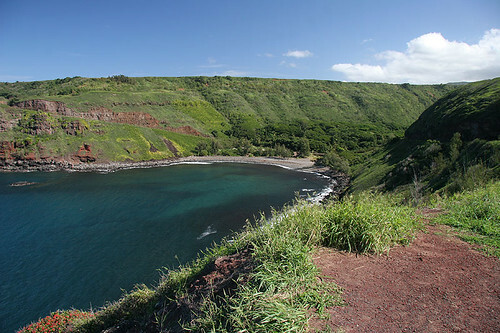 It is not as lush as the road to Hana but still very green compared with South Maui. 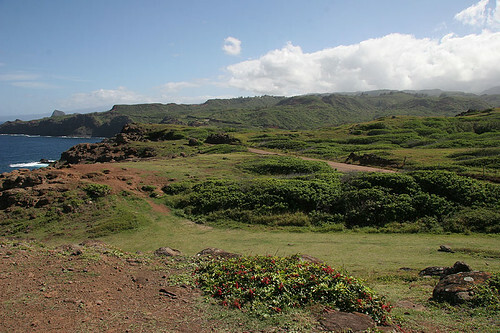 The land is red which contrasts with green flora. The hills are lined with Furcraea which is similar looking to the century plant agaves. 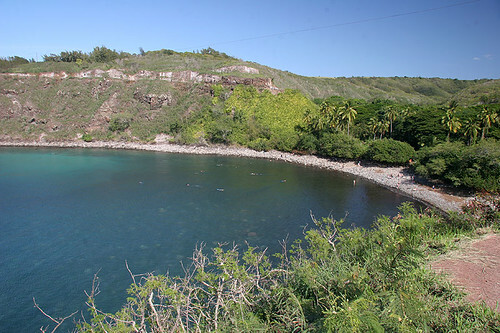 There are ironwood trees and lush bananas along the bays. It actually was similar to the drive from Monterey to Big Sur – just a little more tropical looking. We choose a perfect day. Blue skys and a great view across the sea to Molokai. It was pretty windy especially at the blowhole which is near the northern point of Maui. 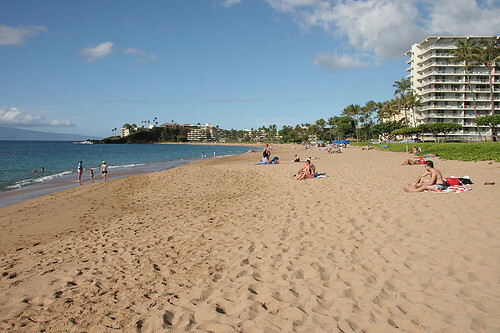 We traced our route back to Napili and then on to Ka’anapali. We wanted to check out this area even though it really isn’t our style. We found a parking spot in the public parking next to the Whaler’s Village. I wanted to go to the Totally Hawaiian Gift Gallery to look for another Hawaiian quilt pillow. I really wanted one in red but they were out so I found a nice pineapple motif in dark blue. We headed back to Napili stopping first at the Time Supermarket to pick up a few supplies and a nice Ono filet for dinner. Perfect day in West Maui.